This is an update regarding a project I started almost two months ago. What are edges? Edges are the in between places; mountains and a valley floor, forest and grassland. These places can be micro-climates, like the riparian zone which is the bank next to a stream. You can find plants flourishing in these in between areas, yet not in either zone. The factors come down to light, water, temperature and nutrients. You can put furrows in the ground to create edges. The bottom of the furrows will get less sun. The bottoms will also get more water and less light. 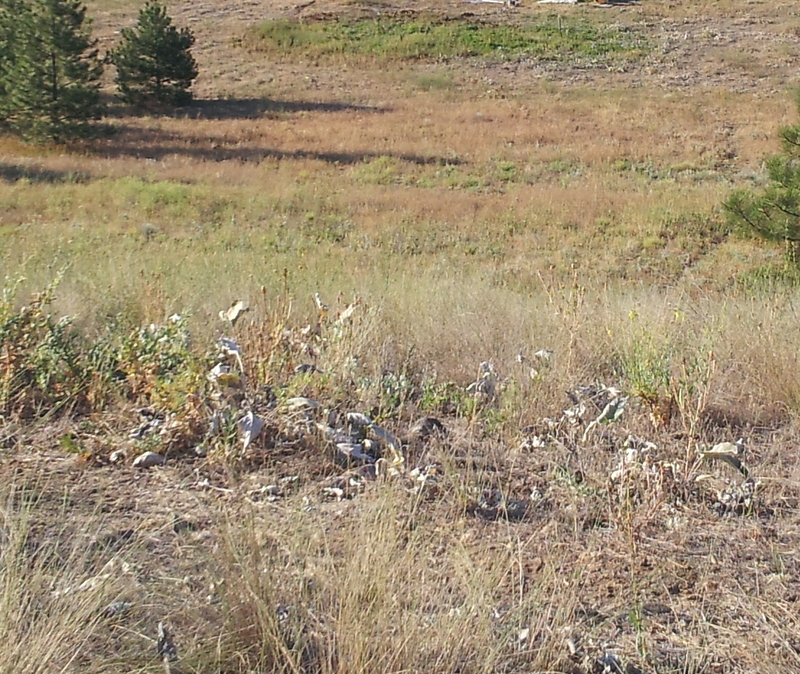 Nutrients can build up in furrows when the wind deposits detritus like pollen, leaves or even topsoil that’s airborne. I’m trying a different kind of edge: shade. I’m hoping that trumpet creepers, growing on hog panels, will create an edge for plant diversity. The plan is that the shady areas will be anchors for plants like clover to survive, thrive and spread with less water requirements. The green spot at the top of the pic is area getting irrigation. The hog panels are there along with the seed/plants I’ve added. The clover is getting thick. 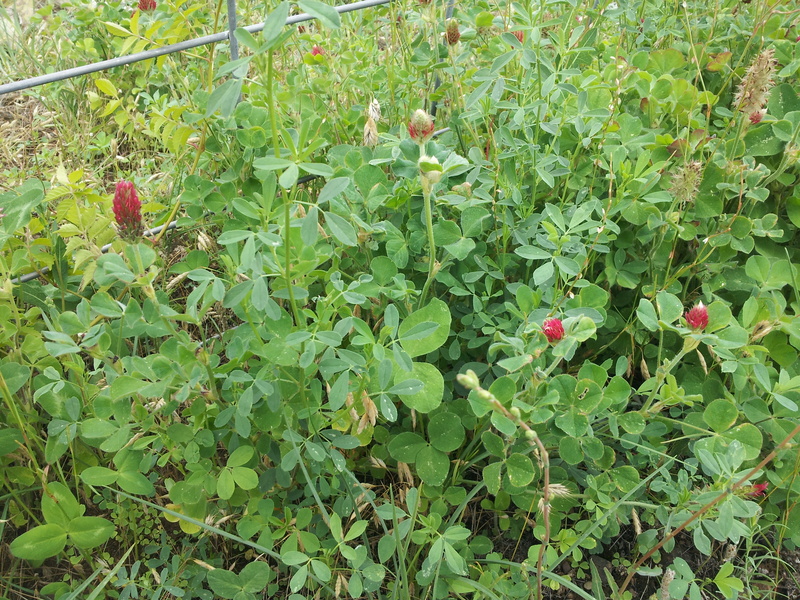 Those red blossoms are clover. The taller plants are sunchokes. The shorter plants with bigger leaves are comfrey. 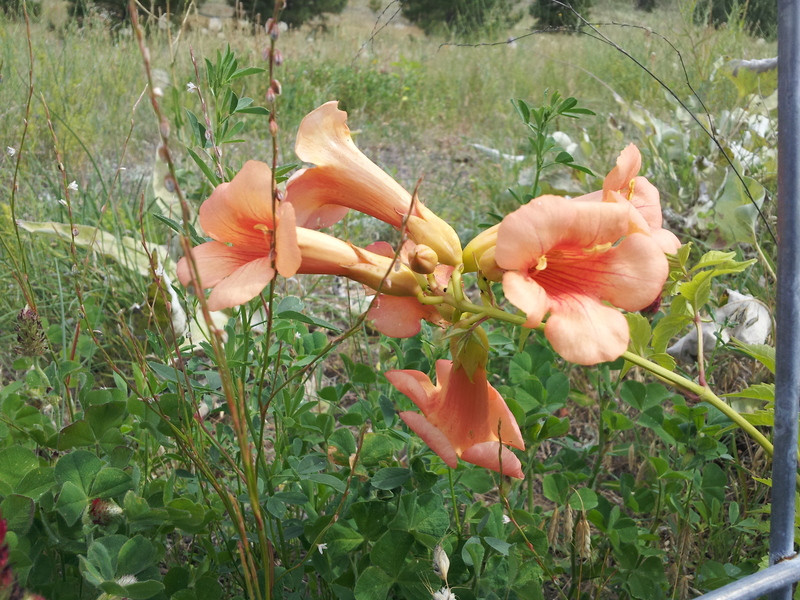 Trumpet creeper. I picked it because it should cover the panel and offer provender to pollinators. 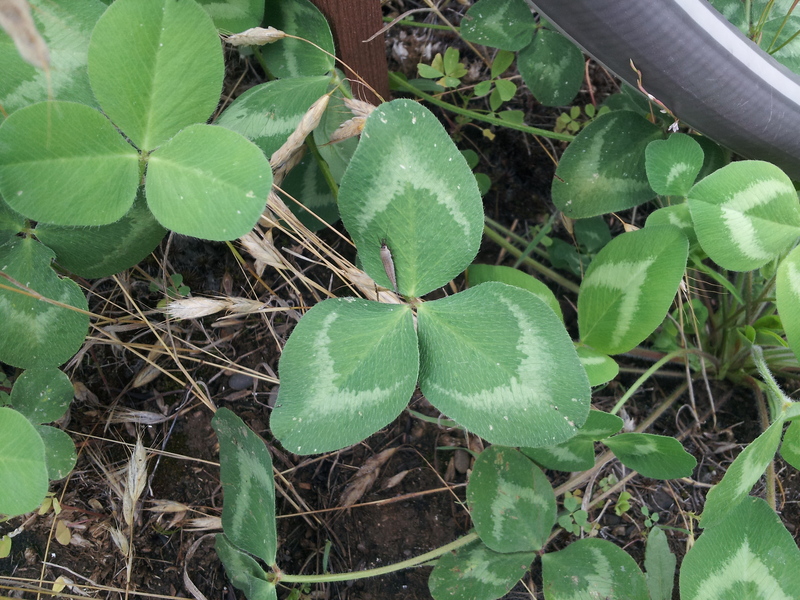 Those clover leaves are huge (technically mammoth). Obviously the creepy crawlies like them. More clover. It’s getting thick. 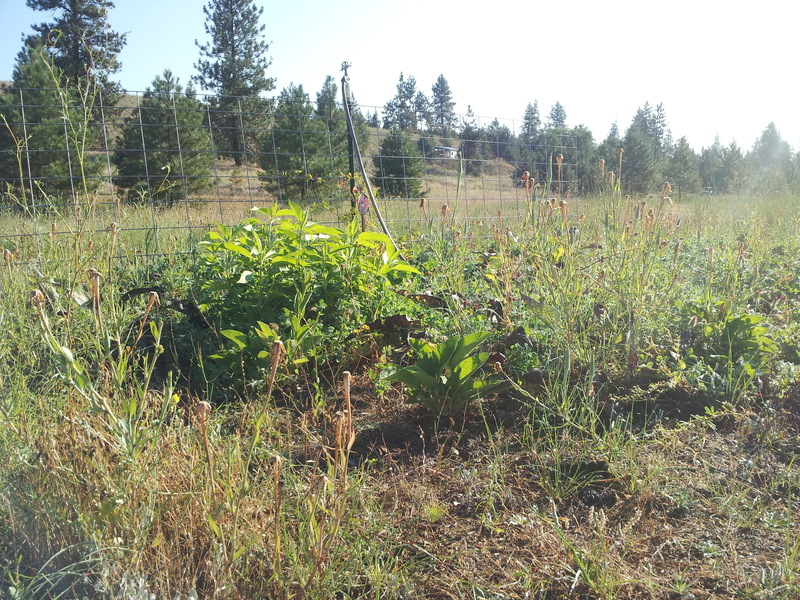 There are radishes and what looks like alfalfa as well. There’s some stuff I can’t identify as well. *shrug* I’m happy. 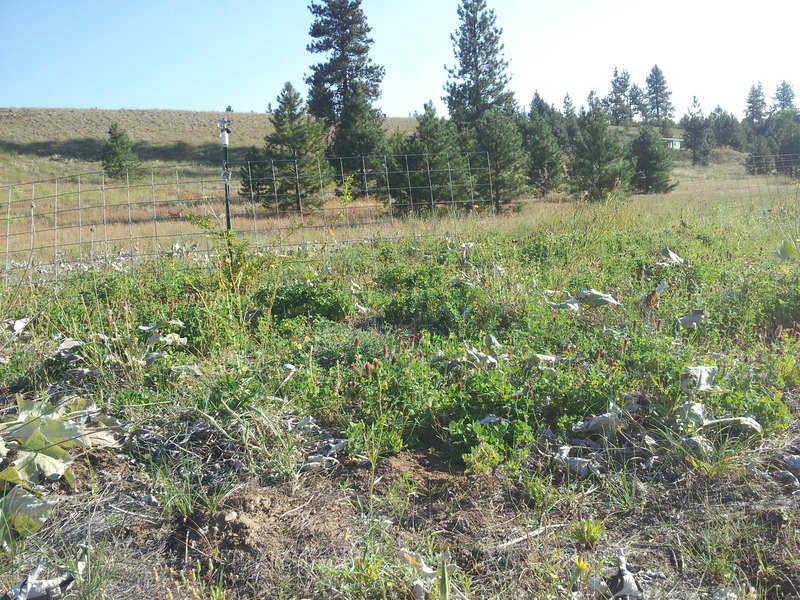 Next year’s goal is to water this area and a control site equally and measure water retention. This entry was posted in Plants, Shrubs and Trees by admin. Bookmark the permalink.